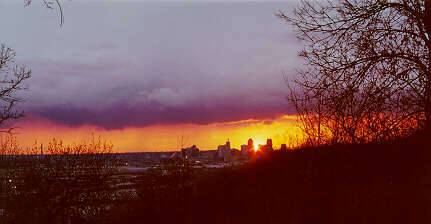 Our house is located on a bluff overlooking downtown St. Paul. 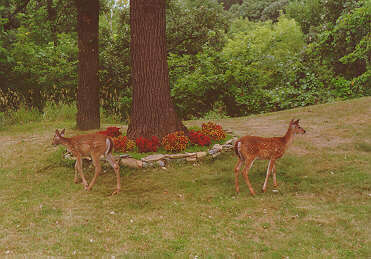 The whole bluff area is a county park so we have many visitors. 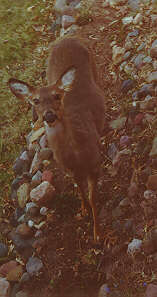 There are six deer in this photo, but we've seen up to nine at a time. 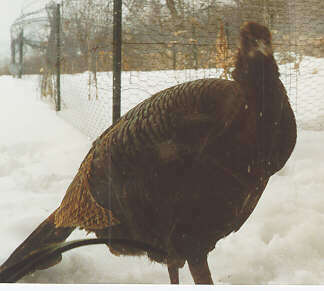 There is also a fox, woodchuck, many grey squirels, a red squirel (who had an accidental tour of our chimney, boiler, and utiltiy room), and five wild turkeys. 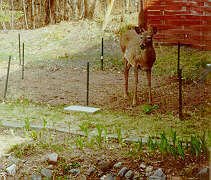 Of course, keeping them out of the garden can be a problem but our deer are pretty well behaved and only eat the weeds. And the raspberries. 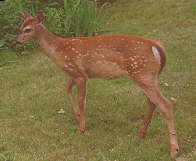 Last summer there were several new fawns. Yes these are real and not plastic garden statues. The St. Paul Airport has a lot of pretty lights at night. The buildings of downtown are visible to the right of the large oak. On New Year's Eve and other occasions, there are fireworks shows down on Harriet Island in the Mississippi river below us and are a great show from our living room.